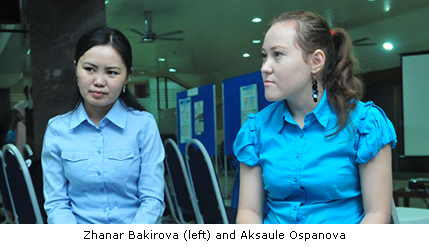 BANGI, 2 Dec 2013 – The diversity of Malaysian culture and its numerous islands, have impressed two Kazakhstani students taking part in a student exchange programme for one semester based at The National University of Malaysia (UKM). Zhanar Bakirova and Aksaule Ospanova, from Almaty, have learnt a lot about Malaysian culture and traditions while participating in the fifth UKM-Global Student Mobility Partnership 2013. Speaking to UKM News Portal at the Mobility Day 2013 Forum and Exhibition here today in excellent English, they said they love the trips around Malaysia and the visits to institutions such as Bank Negara and the various museums in Peninsular Malaysia, Sabah and Sarawak. Zhanar (24), and Aksaule (22), both social sciences post-graduate students from Ablai Khan University in Almaty, Kazakhstan are the only Kazakhstani students in the programme with UKM. Kazakhstan is a Central Asian country that straddles both Asia and Europe, with its smaller part west of the Ural River in Eastern Europe. It is surrounded by Russia in the north and west, China, Kyrgyzstan and Uzbekistan to the east and the Caspian Sea to the south-west. Zhanar, whose parents are both civil servants, said she had heard a lot about Malaysia before coming here and jumped at the chance to take part in the mobility programme through her university. Zhanar and Aksaule toured Langkawi and Pangkor islands recently with 13 other mobility students from other nations, where they experienced home stay at a kampung. For the first time they went to a sandy beach at Pantai Cenang and Pantai Kok, where they tried out some water sports. Unlike Malaysia, Kazakhstan is a land-locked nation which has the Caspian Sea – the world’s largest lake – to its south-west. Zhanar loved visiting the various traditional villages, including the Orang Asli community in Kampung Chueh II, in the Royal Belum Forest, Perak. She finds the indigenous people very different from other Malaysians, while the jungle in the area was the first tropical rain forest she had ever visited. “The jungle was so different from anything I had experienced,” she remarked. Aksaule agreed that the Malaysia was unlike anything she had seen before. She had travelled to Europe before and found the contrast jarring. A soft-spoken young woman of few words, Aksaule said the Malaysian weather was quite a shock to her but she has learnt to adapt to it. She, however, preferred the lecture sessions held at the Faculty of Social Sciences and Humanities to roughing it out in the hot sun. “Here, just walking outside you can sweat a lot. In Kazakhstan, because it is arid, you sweat far less,” she said. While Aksaule finds Malaysian cuisine such as satay and ketupat interesting, she and Zhanar misses Kazakh food a lot. “We are not used to spicy food,” she added with a wry smile. How did they cope with the food? At least once a week, during a break in their course, they go to a Kazakh restaurant in Sri Petaling near Kuala Lumpur for meals that are more agreeable to their palate. There they also get to meet up with other Kazakhstanis who live in Kuala Lumpur and Petaling Jaya. Their other sojourns include a historical tour of Melaka, a visit to Putrajaya, Gallery museum of Bank Negara Malaysia, the Perak Matang Mangrove Conservation and Sustainable Industry in Taiping and the Sarakraf handicrafts centre and Sarawak Cultural Village in Kuching.